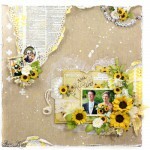 Hello again crafters! 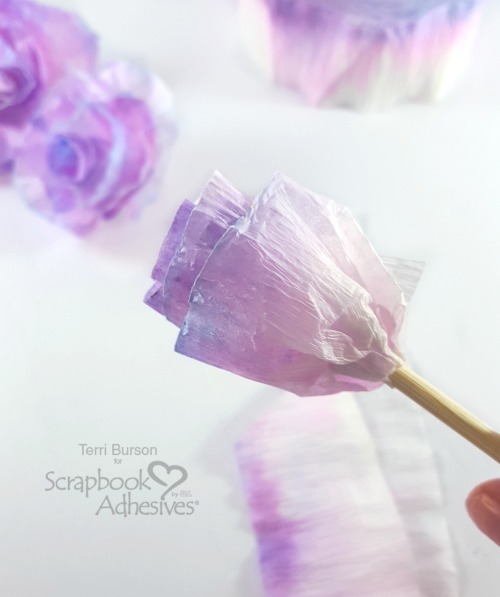 Terri here, with an easy DIY project that turns ordinary white crepe paper rolls into beautifully colored crepe flowers! 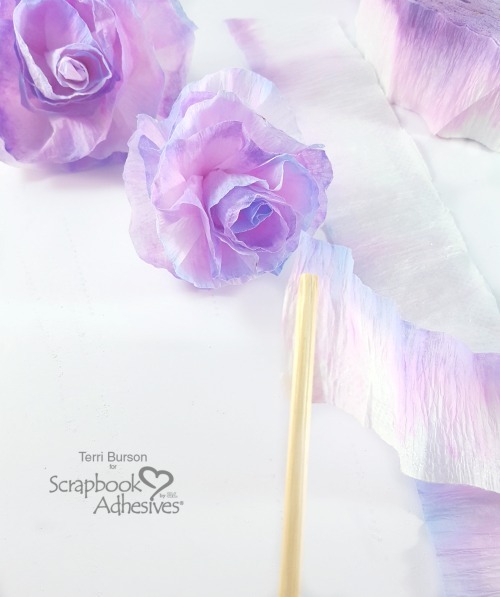 I’ve got a quick video at the end as well, showing you how to easily spin and twirl these pretty blossoms. Let’s get started, shall we? 1. Add water to a large glass bowl or pie plate to just barely cover the bottom with water. It’s important that you do not overfill or over-saturate the crepe paper. 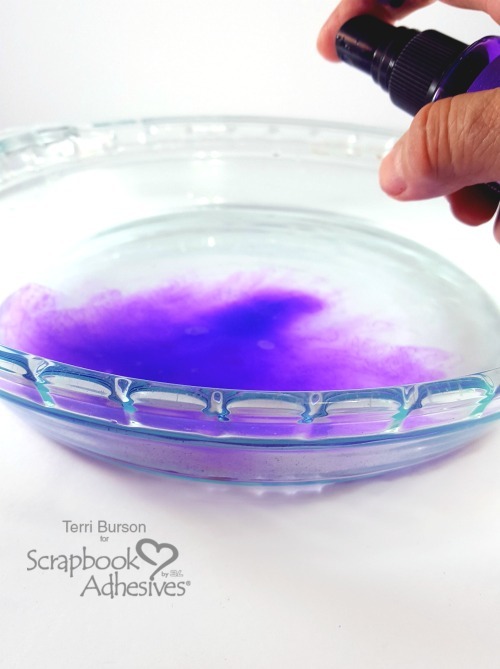 Spritz several times with a variety of ink sprays into the water and stir gently. 2. 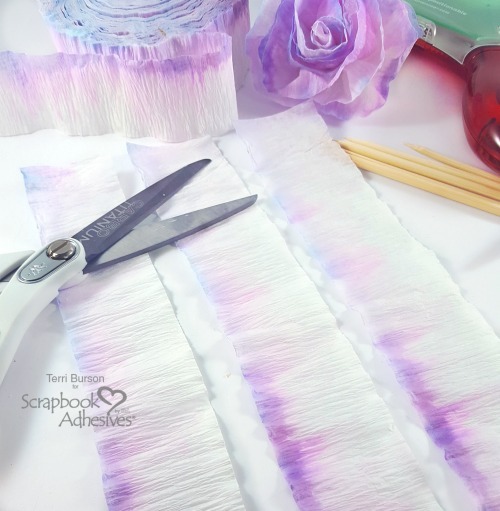 Dip the entire roll of white crepe paper face down into the mixture, soaking up most or all of the water. 3. Now, spritz a little more spray into the empty pie plate and dip the crepe paper into the added mixture. I chose to only use my darkest shade of purple for this step. As you can see, the watercolored mixture will begin soaking up about halfway down the side of the roll. Do not soak the entire roll. This roll needs to dry. 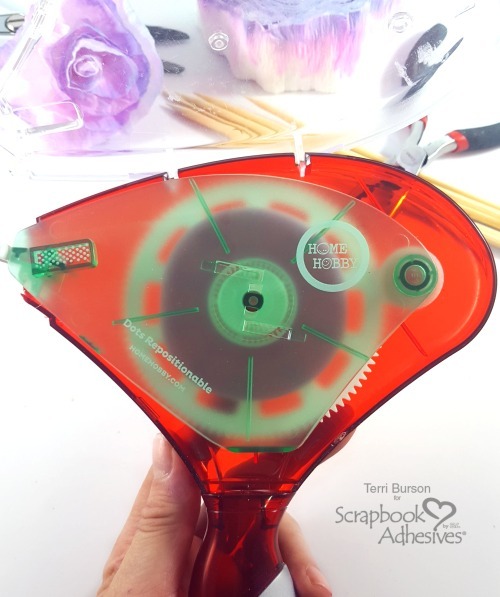 I did not want to risk using a heat tool and burning my crepe paper. Find a warm, sunny spot in your house and let dry naturally on a cookie rack. This may take a day, possibly two. Or, you could do like I did and let it sit on the dash of your car in the hot sun while you’re at work! 4. Next, place the E-Z Runner® Grand Repositionable Dots Refill cartridge into your E-Z Runner® Grand Refillable Dispenser. 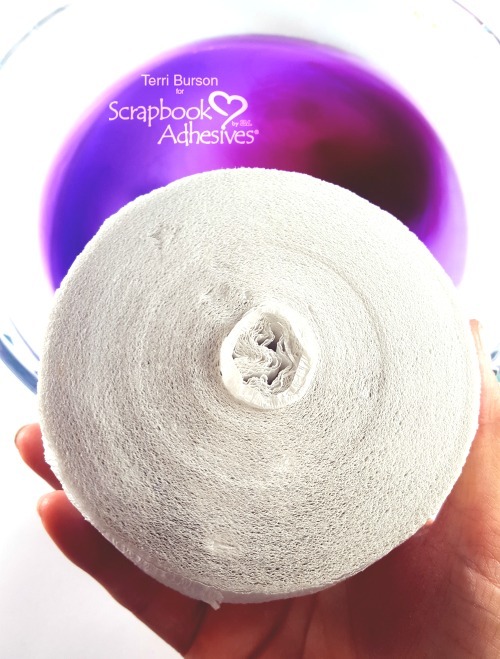 Using repositionable adhesive make it easier to repair any mistakes by unrolling and re-rolling your strips of crepe paper. 5. 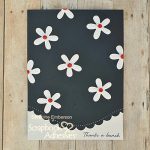 Cut 3 strips of crepe paper to desired length for one flower. I cut approximately 14″ for each strip. The more strips you use, the larger your bloom. 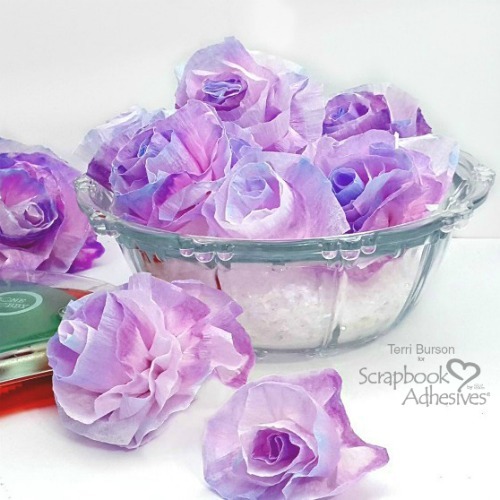 You can also use just one strip for very small blossoms. 6. 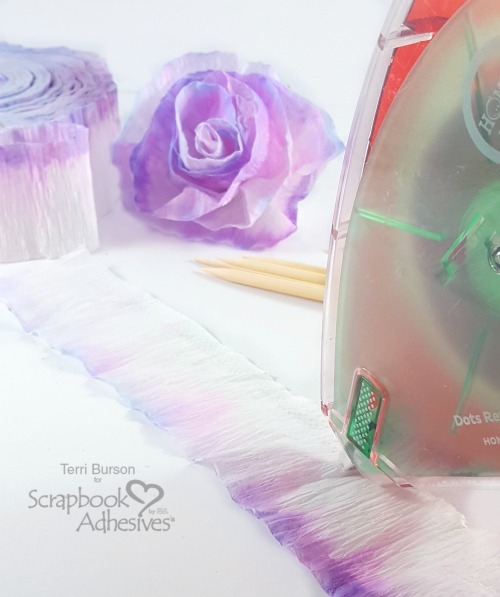 Apply your Repositionable Dots adhesive along the length of the crepe paper strips, on the bottom, non-colored portion. 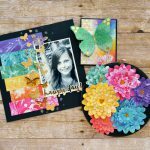 The advantage of using the E-Z Runner® Grand Repositionable Dots Refill is that it won’t tear your crepe paper. Yet, it magically holds everything together. Wow! 7. Begin rolling, in the direction that is most comfortable for you. As you roll, you will want to pinch and gather the bottom after each turn, to help form your shape. 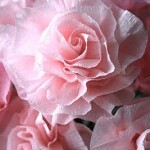 As you can see below, this is the size of a blossom with just one strip of colored, crepe paper. You can view my short video at the end of this post, if you’d like to see the rolling in action. 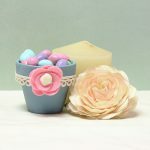 You can easily peel your flowers off the wooden dowel for use in a decorative bowl, or you can leave in place and decorate your dowel for use in a vase. 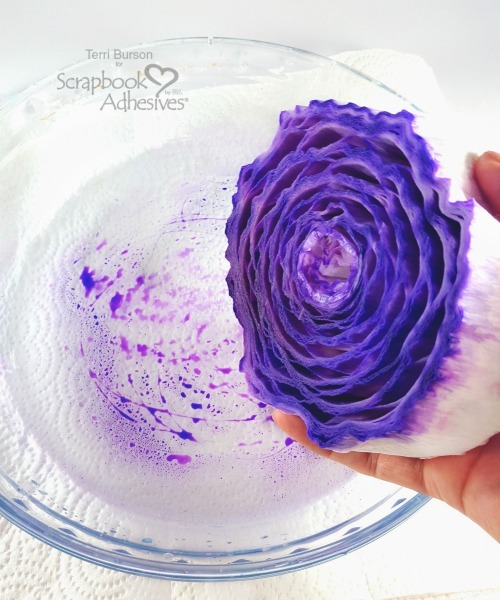 If you like, you can embellish your flowers even further by adding a touch of glue from the Dual Tip Glue Pen along the line of your petals, and dusting with extra fine glitter. You’ll see me talk about this in the video below. This entry was posted in Adhesives, Beginner, Crafts & Tutorials, E-Z Runner® Grand, Home Decor, Other Adhesives, Permanent Adhesive, Repositionable Adhesive, Skill Level, Tutorial and tagged Crepe Paper, Dual Tip Glue Pen, E-Z Runner Grand Dispenser, E-Z Runner Grand Repositionable Dots Refill, Flowers, Process Video, Ranger Ink, Tutorial, Video Tutorial. Bookmark the permalink. 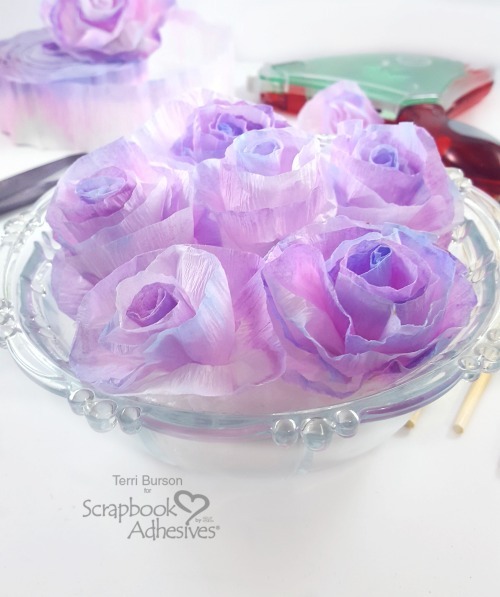 One Response to "How to Create DIY Colored Crepe Paper Flowers"
Stunningly gorgeous and surprised easy technique rendered such good results . Great job .